Sipping on sodas, coffee, or tea throughout your day may put a pep in your step, but it’s not helping your teeth. Years of stains from dark-colored foods and drinks make your smile look dull and yellow. Even if you are brushing in the morning and at night, it still may not be enough to give you the stunning smile you want. Here are a few options at varying prices to help you get a smile that lights up High Point, NC. Simply brushing your teeth, flossing, and using a dental rinse is a great place to start. You can pack a travel-size toothbrush and toothpaste in your purse or briefcase to have at the office. When you stop to use the restroom or take a coffee break, give your teeth a quick refresh. This can help your oral hygiene overall, which is always a good thing, in addition to whitening your teeth. If you want to use a do-it-yourself approach to whitening your teeth, you might see some improvements by simply brushing, flossing, and using mouthwash with products designed for whitening. At many retailers and pharmacies in High Point, NC, you can purchase any brand of whitening products to try at home, including activated charcoal or a tooth whitening toothpaste. Brush your teeth with these products as directed on the packaging. At many stores, you can find lots of different brands of whitening strips and pens. The whitening strips can be easily placed on your teeth and worn discreetly. The whitening pen is to be applied to your teeth when they are clean and dry. You can apply the strip or gel to your teeth and leave them for 30 minutes to treat your teeth. Generic mouth trays with bleaching gel are available in retail stores and may have the same look and feel as the trays provided by your dentist. The main difference between over-the-counter and professional teeth whitening systems is customization. The trays in an over-the-counter kit may feel uncomfortable or leave you with uneven results. The bleaching gel in a store-bought kit is also not designed to fit your specific needs, so you may end up with tooth sensitivity or other problems. Along with some whitening gels and strips, you can add a special light. Available as an LED light mouthpiece, these devices have a set time (usually ten minutes) for you to wear after you have applied your whitening gel or strips. You need to be aware that store-bought products are not going to give you the same results as professional teeth whitening. The products are only strong enough to work on your actual teeth, so if you have any restorations (bridges, crowns, inlays, or onlays), your results will be visibly uneven. Plus, the use of these products can make your teeth and gums really sensitive and tender. Ask your dentist if they recommend any of the whitening products found in stores and how they compare to treatments they provide. At your dentist’s office, your regular exam and cleaning can not only keep your teeth healthy, but they can also improve the appearance of your smile. Removing the build-up from your teeth is an excellent way to make your smile brighter. For more dramatic results, ask your dentist about professional teeth whitening options. Your dentist may offer laser teeth whitening, custom home whitening kits, and veneers. 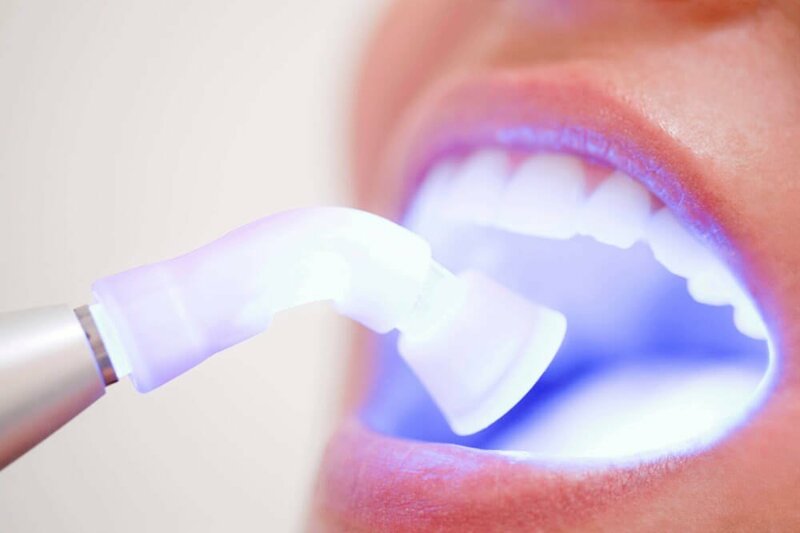 Your dentist can apply a medical-grade whitening gel to your teeth and then expose the treated teeth to the laser light. The heat from the laser is what produces the best results. This technique is great for when you need your teeth whitener in a hurry for a special event or if you have dental restorations. Certain laser teeth whitening systems can also help with internal discoloration, which cannot be improved with store-bought whitening kits. If you’d prefer to whiten in the comfort and privacy of your home, ask your dentist about a professional home whitening kit. With custom-made dental trays for a comfortable fit along with professional-strength whitening gel selected for your needs and goals, a home whitening kit from your dentist is a much better choice than store-bought products. After applying the gel to the trays, you put it over your teeth for however long you were you were told by your dentist. Then, you can take the trays out, clean them, and store them for the next use. At your next appointment, you can get a refill on your whitening gel. Do not use over-the-counter whitening products with your custom trays since they may cause damage to the trays. You can use a home whitening kit alone or to maintain your results after laser whitening. If you want to make your smile brighter quickly and cover other cosmetic flaws (such as chips, gaps, discoloration, short teeth), cosmetic veneers may be a good option. Porcelain veneers are custom designed to look natural and fit comfortably over your teeth. Veneers are a great option if you have internal stains or stubborn discoloration that cannot be improved, even with professional whitening treatments. If you’re tired of limited results or tooth sensitivity caused by over-the-counter teeth whitening products, ask your dentist about professional teeth whitening options. DentalWorks in High Point, NC offers laser teeth whitening, home whitening kits, and cosmetic veneers. All of these options will be customized to match your needs and goals, so you get impressive results without compromising your oral health. Ask about professional whitening options at your next visit or call to schedule a consultation so you can start enjoying a smile that's confidently bright.